Where is this immense gallery of scratched and polished carvings? Who was the sculptor? What was the clay? Hayden Peak, constructed of sandstone and quartzite masonry on a Cyclopean scale. 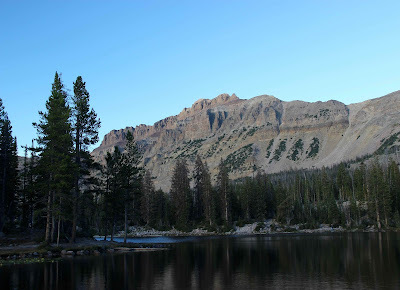 One cool evening high in the Uinta Mountains of northeast Utah, I strolled along Butterfly Lake below Hayden Peak, hoping to catch its Cyclopean masonry illuminated by alpenglow—or at least the golden light of early evening. But the brilliant reds and purples I imagined never appeared. Instead, the mountain simply turned dull and then dark. 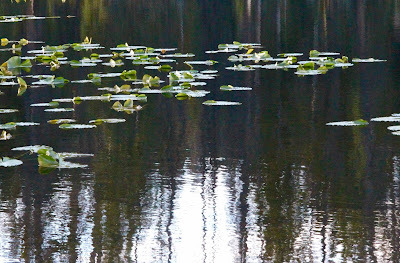 Yet at the same time, the lily pads at the west end of Butterfly Lake glowed in the low light, joined by tree reflections floating on the water. 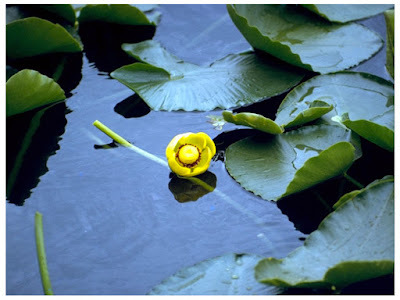 Other common names include yellow pond-lily, for obvious reasons; spatterdock, because the capsules burst and spatter seeds about; and brandy-bottle, for the shape of the capsule. 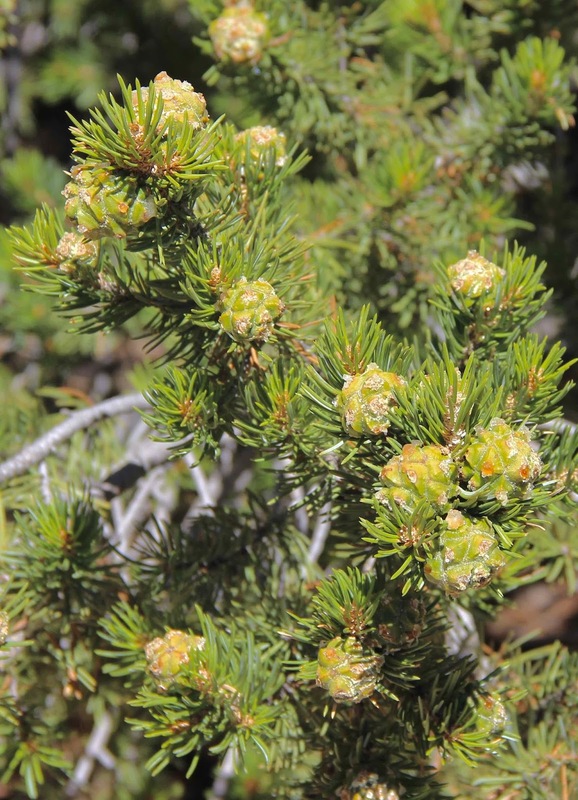 Yellow sepals surround the pistil and stamens; petals are inconspicuous (source). 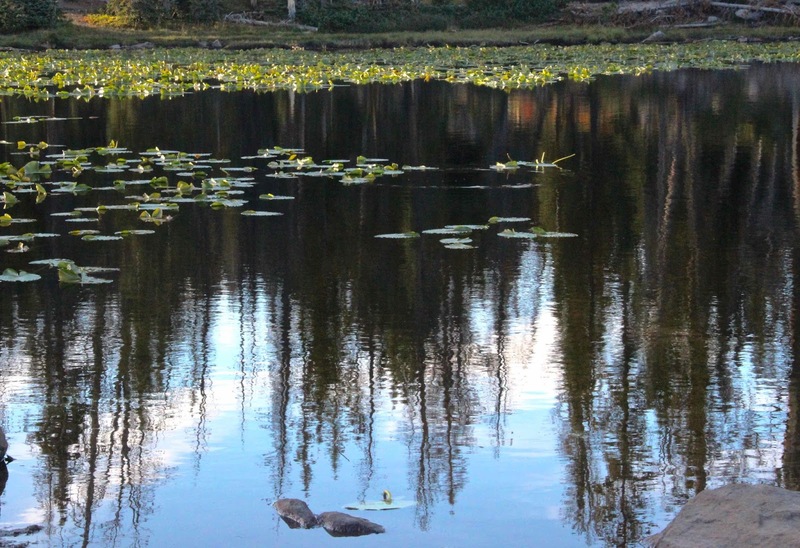 See the half-submerged brandy bottle? 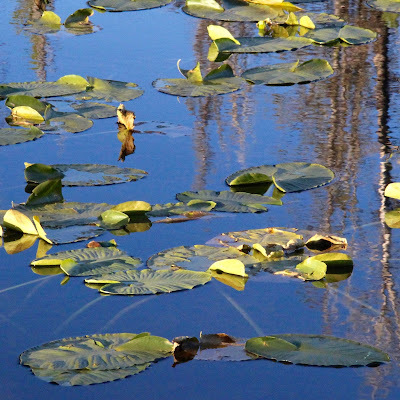 Leaf stalks grow directly from large thick rhizomes firmly buried in mud. Blades can be a foot across. 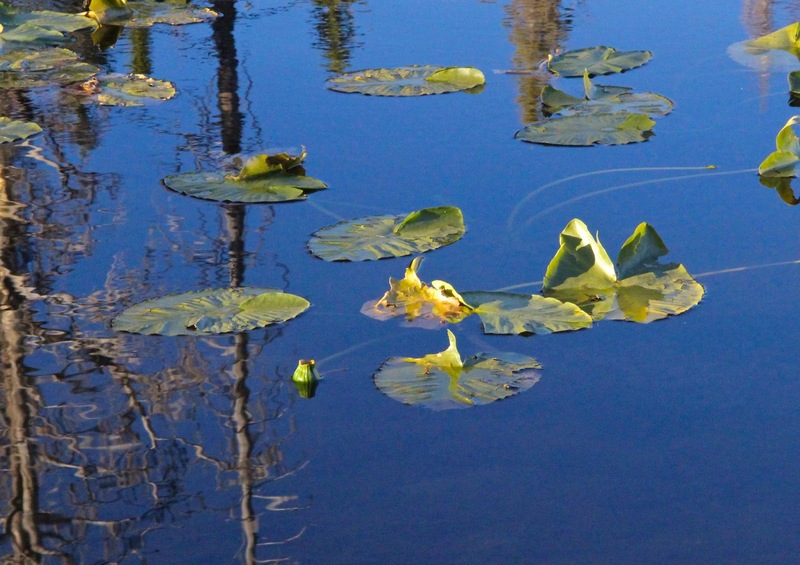 Lily pads (leaf blades) usually lie flat on the water surface, providing hideouts for fish, frogs and other aquatic critters. 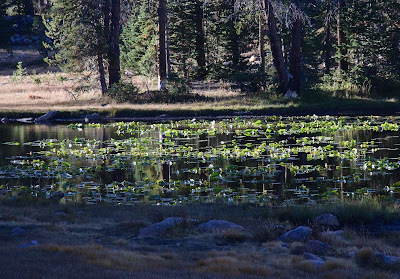 But the season at Butterfly Lake is winding down. 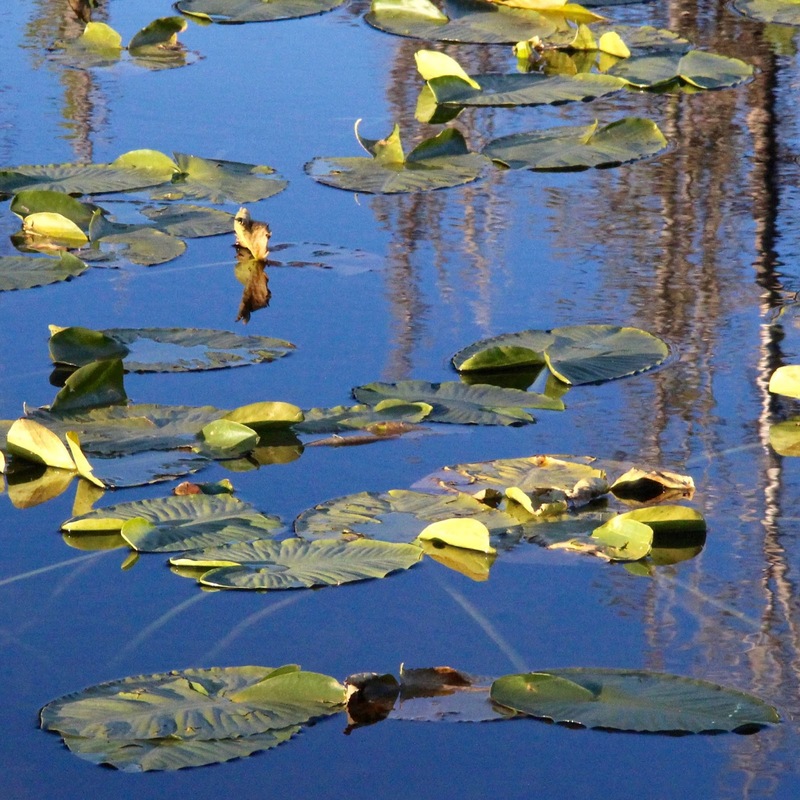 The water level has dropped, and leaves are starting to dry, fold up, turn color. 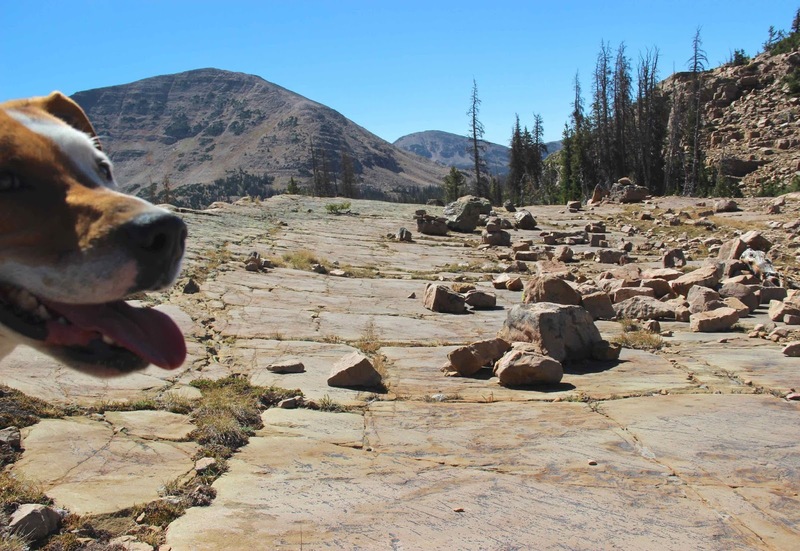 The sandstones and quartzites of Hayden Peak started as sediment in a rift valley back when the continent was being torn apart 750 million years ago (Late Proterozoic). 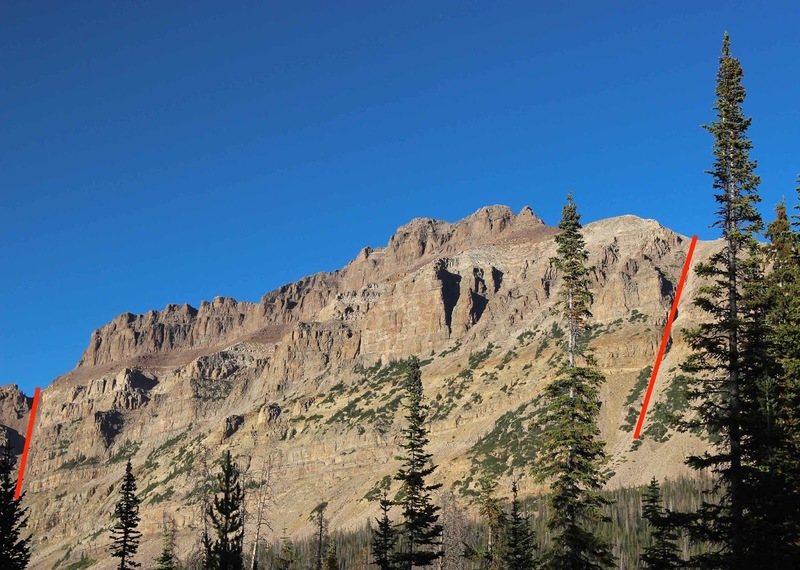 The faults on either side of the peak are much younger—maybe created 65 to 40 million years ago when the range was being uplifted. 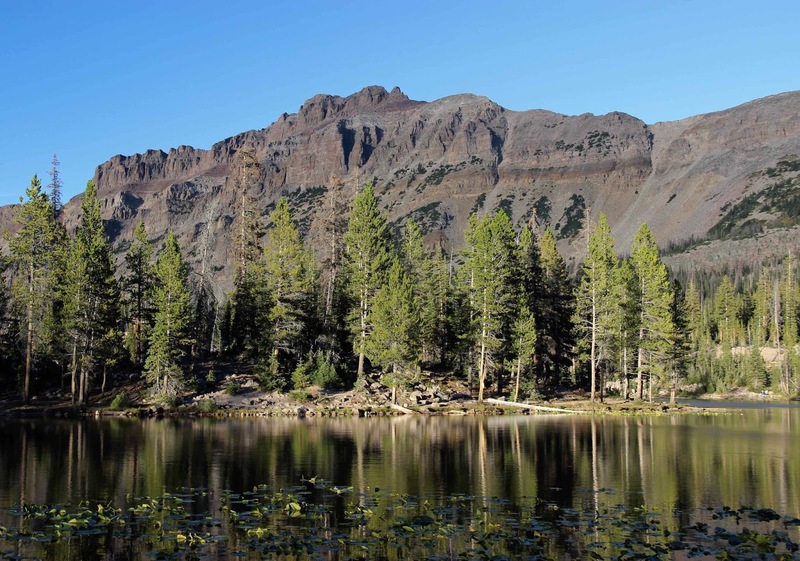 The summit of Hayden Peak is 12,479 feet above sea level. Red lines mark faults. Dehler, CM, et al. 2005. Uinta Mountain geology. Utah Geological Association Pub. 33. Emmons, SF. 1877. 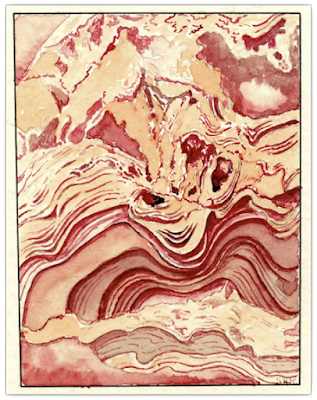 Descriptive geology: US Geological Exploration 40th Parallel (King). Volume 2. Hansen, W. 1969. 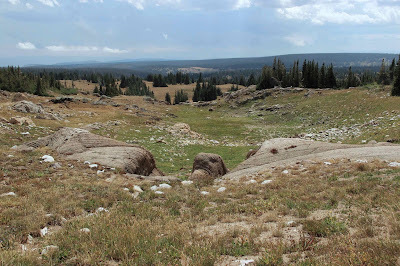 The geologic story of the Uinta Mountains. 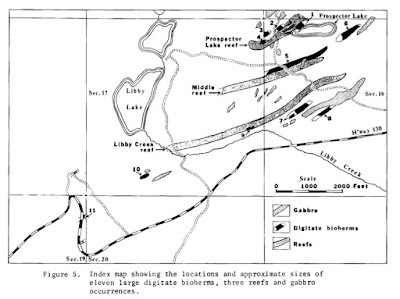 US Geological Survey Bulletin 1291. PDF available here. Welsh, SL, et al. 1987. A Utah flora. 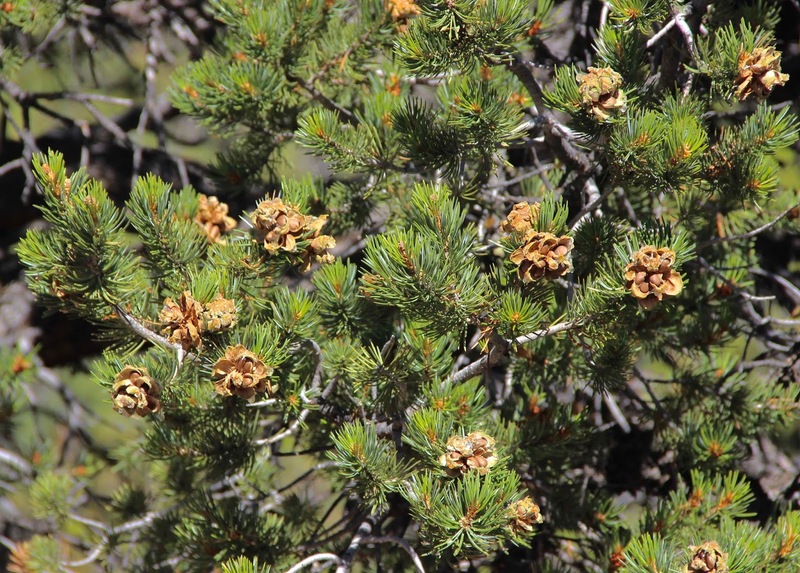 Great Basin Naturalist Memoirs No. 9. This month I have no news about the serviceberry I’m following. I’m far from home, in a warmer drier land. So instead, here’s a report of a tree I came across on a narrow precipitous ridge crest, holding a boulder in its roots! This was curious enough in itself, but just as interesting were the thoughts it brought to mind. 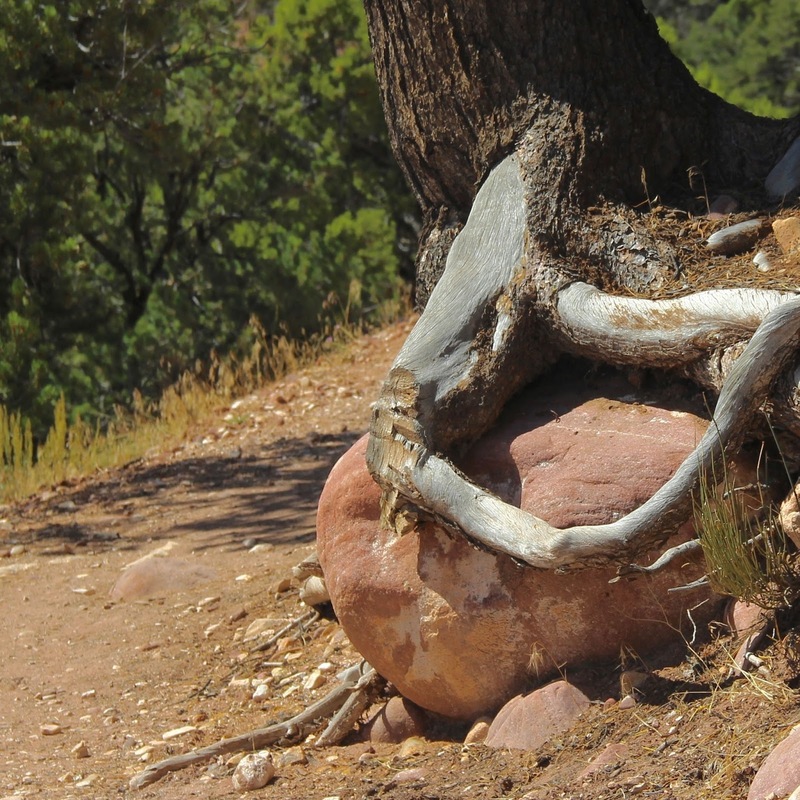 I realized this tree was keeping the boulder from continuing a trip that had started maybe sixty million years ago. Trapped by the tree, it couldn’t make the next leg—a steep 2000-foot descent to the Green River. But the delay would be minor, basically imperceptible. Even five hundred years of imprisonment would be but a fleeting obstacle in this boulder’s journey. 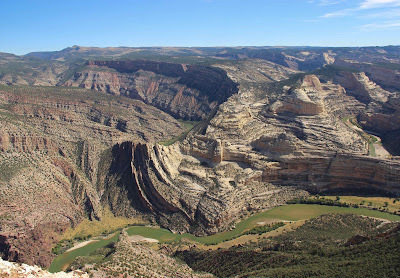 Next leg of the trip—down to the Green River, 2000 feet below the ridge crest. 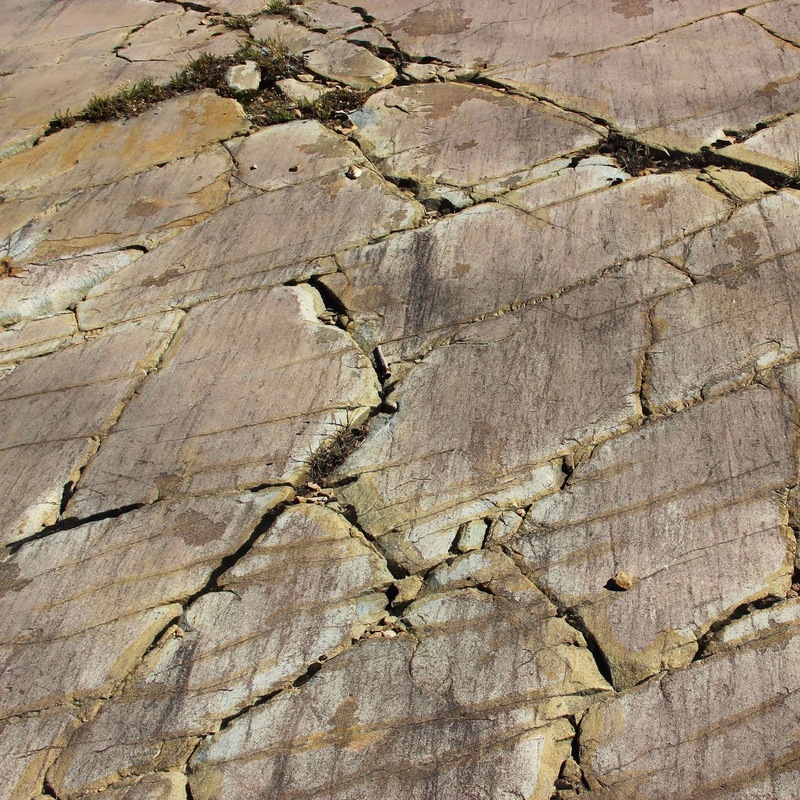 This is not a local rock—not sandstone, siltstone nor shale. 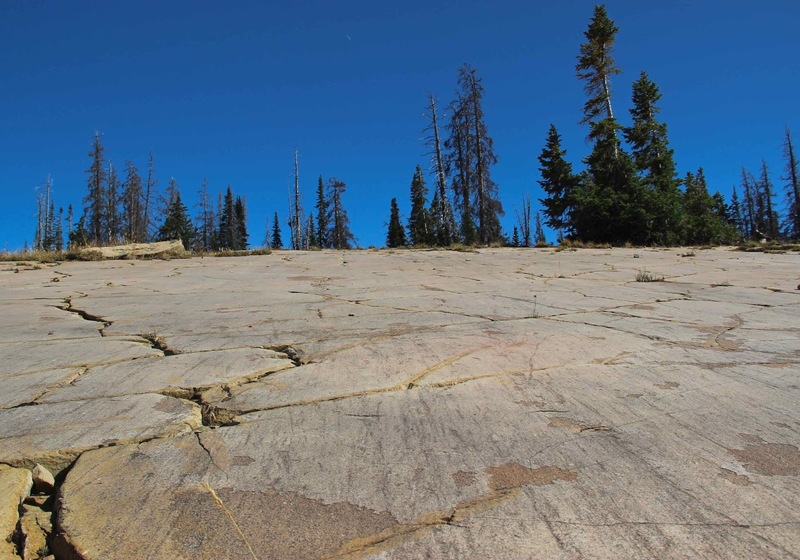 It’s hard tough quartzite, which is why it survived the long punishing journey that started 60 million years ago in the high country of a newly-created mountain range to the north. 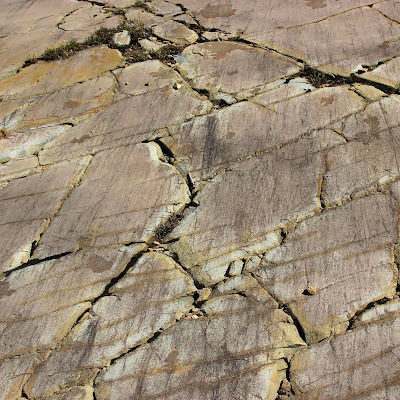 A fragment of bedrock—perhaps broken by folding, faulting, or frost—was carried many miles by streams, bumped and bashed, worn smooth and round, and left here. The rock itself is far older than the mountain range. It began as sand in a deep rift valley, 700 million years ago. 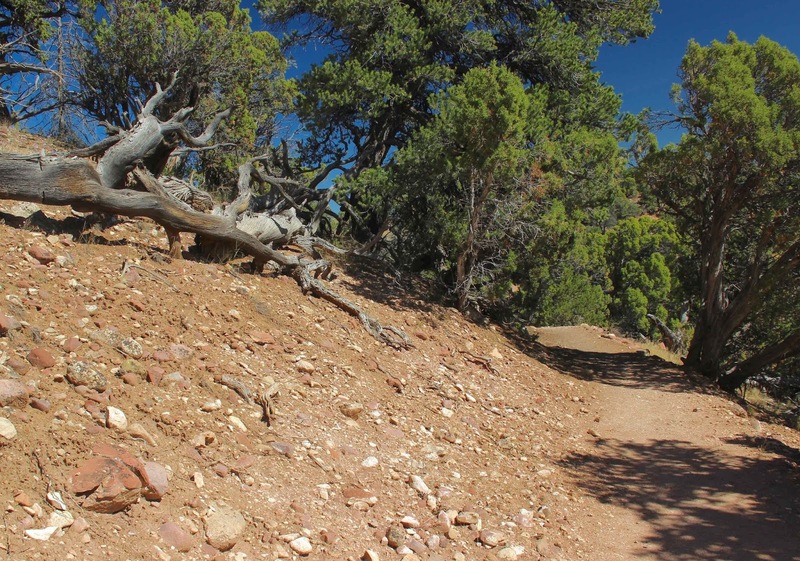 The piles of sand, rock and dirt along the trail used to be part of a mountain range. 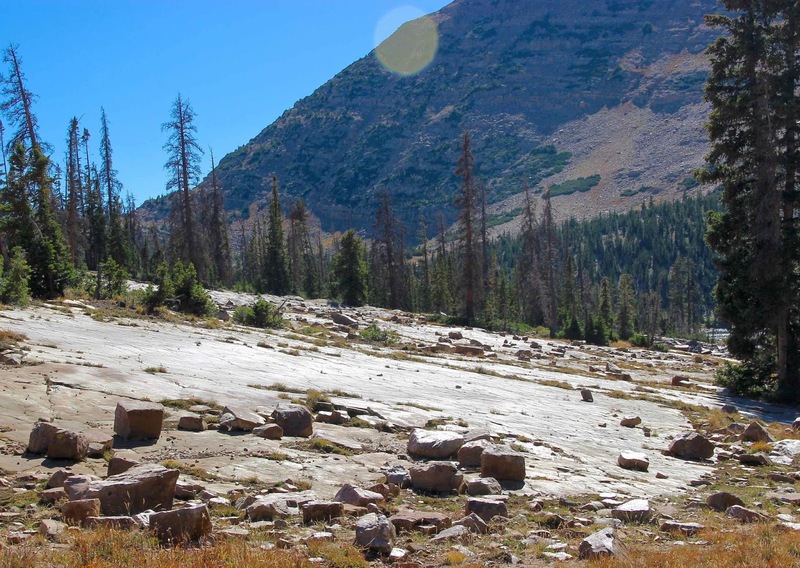 The amount of debris carried down and deposited was so immense that the mountain range was largely buried in its own rubble. 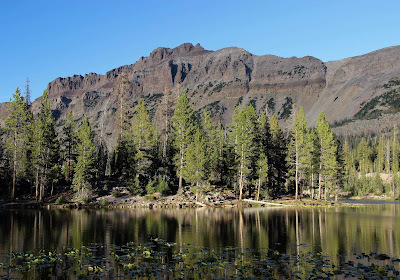 Probably only the highest peaks stood above extensive gently-sloping surfaces. Then the land rose again—not as mountains, but the entire region. Erosion went back to work, this time exhuming the old buried landscape. 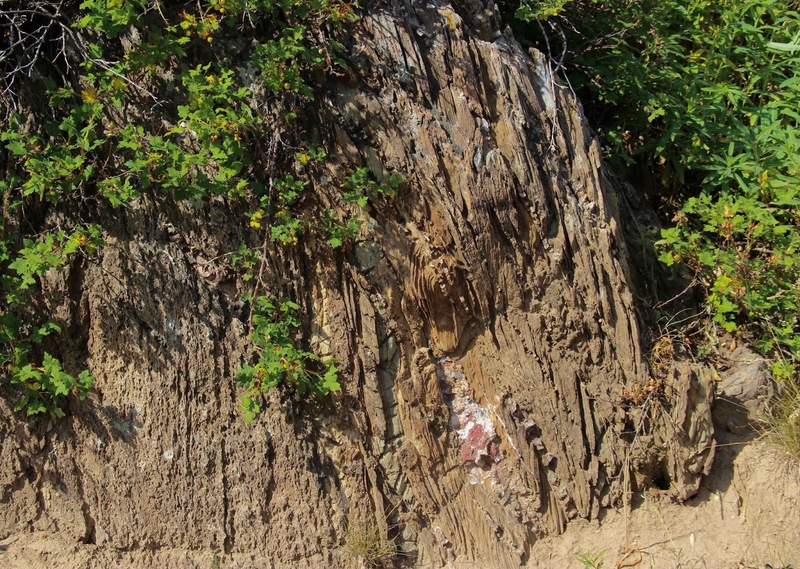 It removed much of the debris deposited just a few million years before, but not all. Relic patches remain today on high surfaces—like the narrow precipitous ridge I walked. But unless things change, this too will be gone. 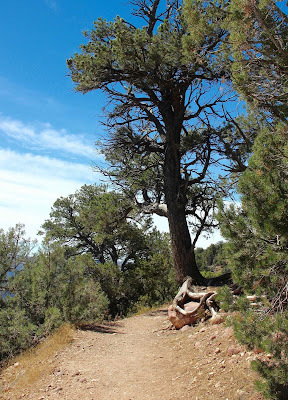 In the meantime, the quartzite boulder will have to wait a bit, because hundreds of years ago a pine seedling managed to get established and now has grown large. 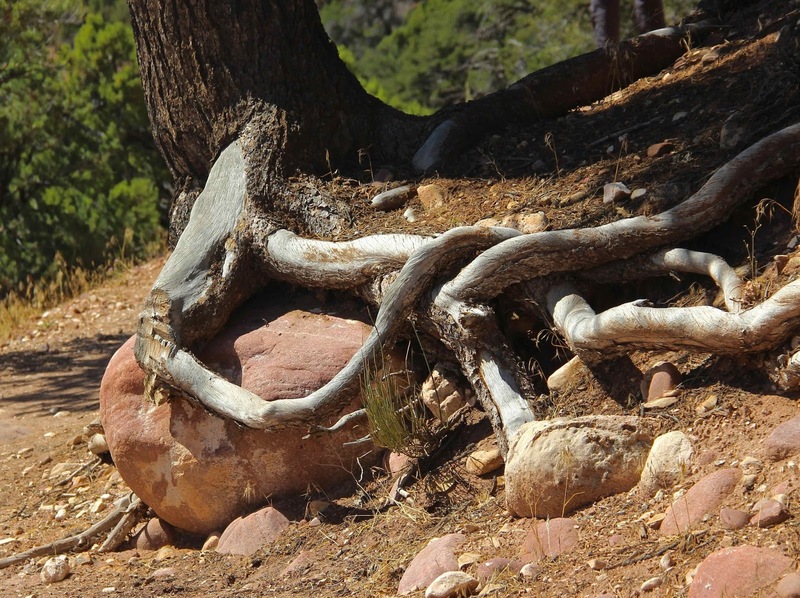 Its roots grew down into the pile of debris, circumvented the quartzite boulder, and trapped it. Though trail construction exposed the boulder, it can’t roll down to the Green River just yet. 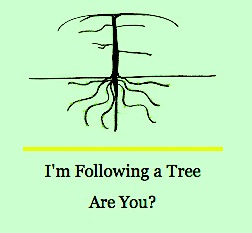 It has to wait until the tree dies and the roots decay. But given the scale of its life, I doubt that it feels the least bit impatient. Now let’s consider the tree. It’s a pinyon—Pinus edulis (“pine edible”)—one of millions growing in the vast pinyon-juniper woodlands of the American West. 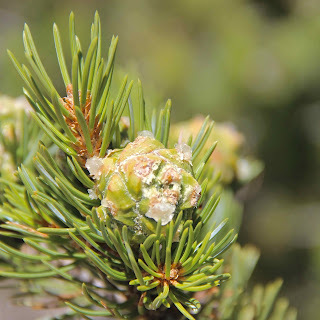 Because pinyons live in country that is cold in winter and dry for much of the growing season, they grow slowly, never getting very big. But they are trees of great bounty, producing abundant large seeds beloved of squirrels and jays and little boys. 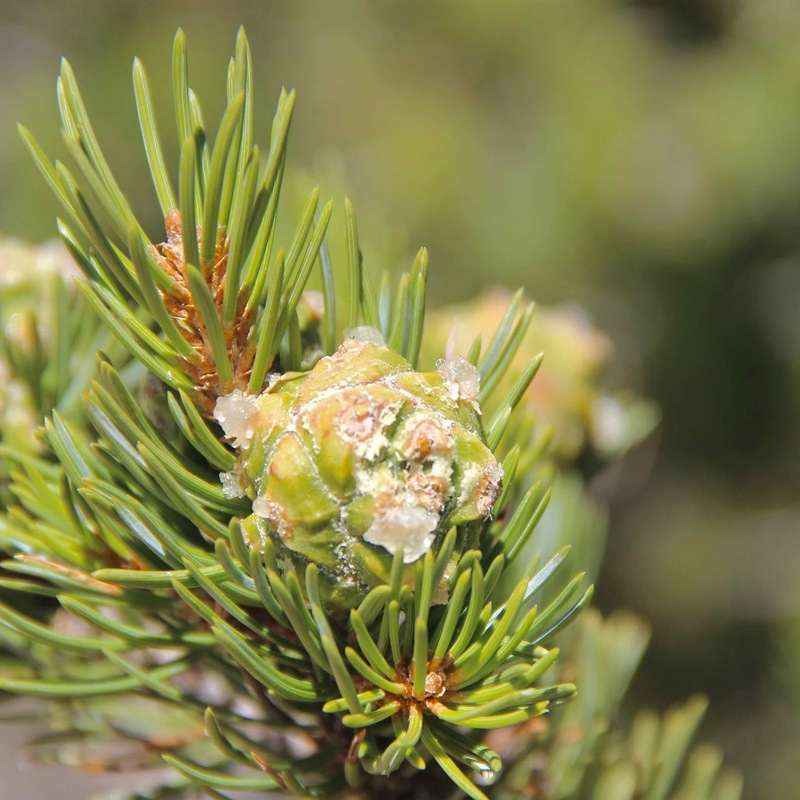 The sticky green young cones contain maturing seeds, on which wildlife will depend for winter survival (as did people in the old days). With the right beak or teeth, older cones can be torn from the tree and pulled apart to get at nutritious seeds. 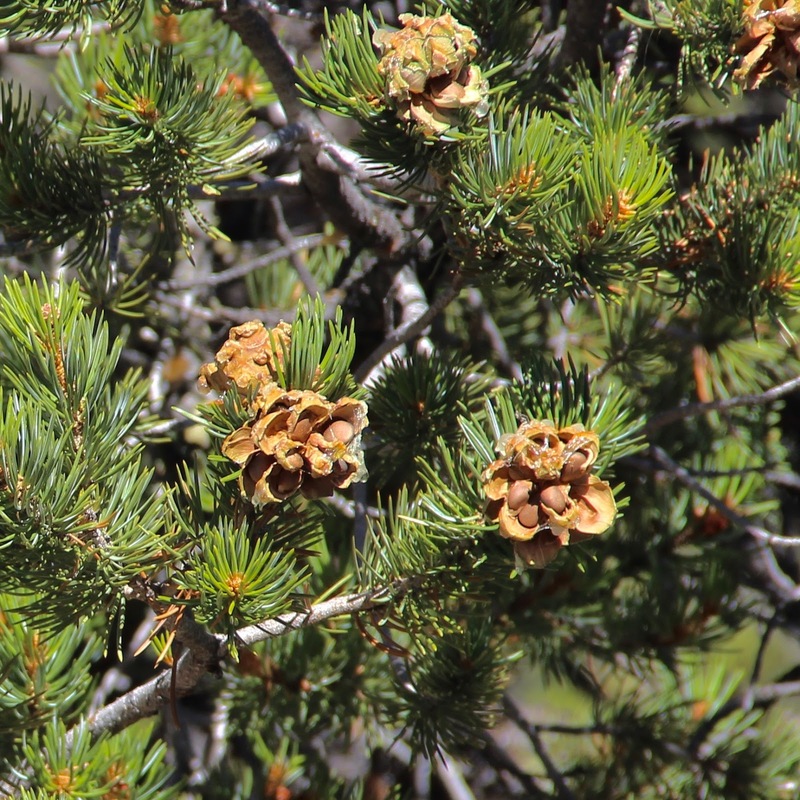 Left alone, cones open on the tree and seeds fall of their own accord. 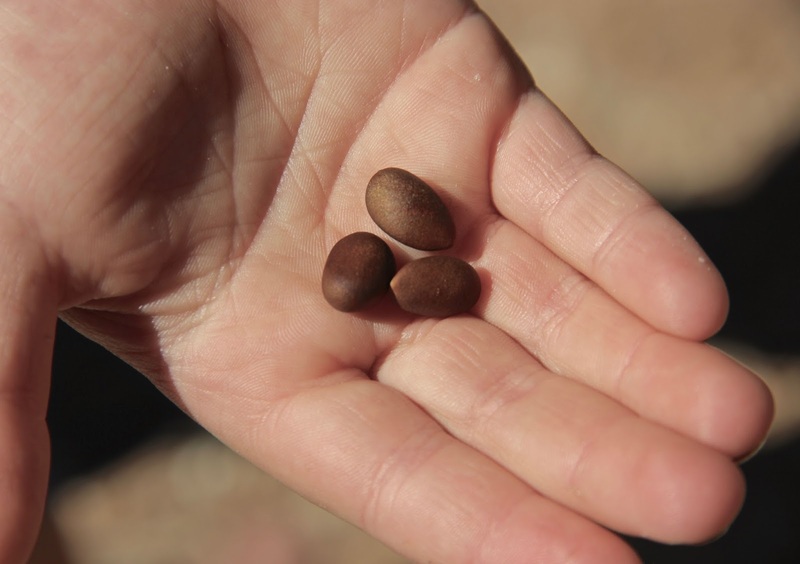 Big tasty pinyon nuts are worth hunting for—even if you’re only five years old! Monthly tree-following gatherings are kindly hosted by The Squirrelbasket. 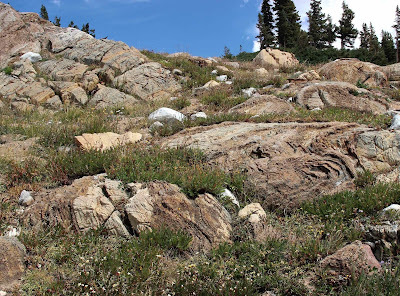 Stromatolite Hike, my seventh post, was the one that got me hooked on blogging. It was the first one I was pleased with. It told a good story, I liked the photos, and putting it together cemented knowledge and memories firmly in my head. 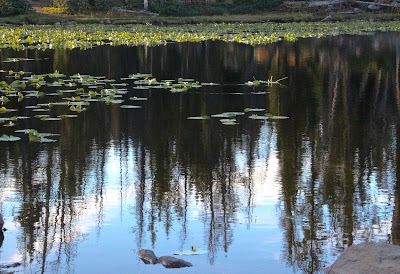 When I tossed it out into the blogosphere, somehow 40 readers found it ... that same day. “Amazing!” I thought. What a great way to share my adventures and enthusiasm for natural history. Five years later, I’m still hooked on blogging and looking into the far distant past. 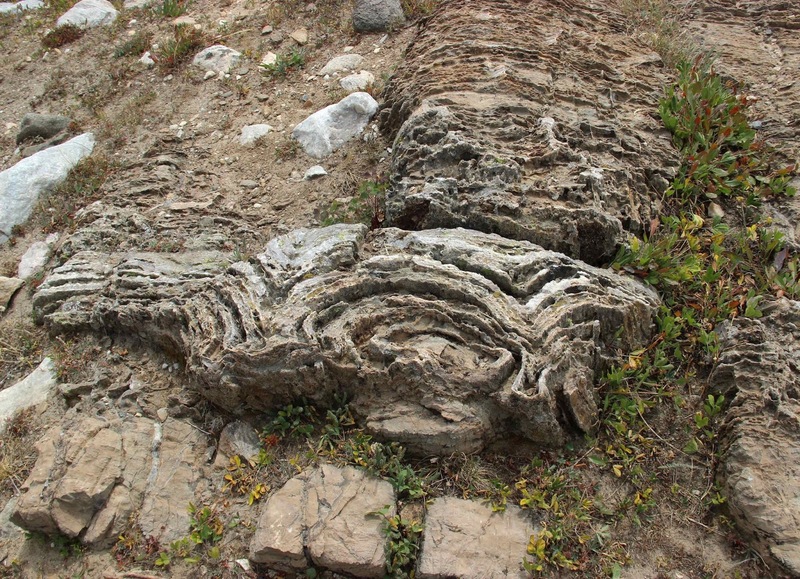 In celebration, here’s another stromatolite hike—actually, more like a pilgrimage. 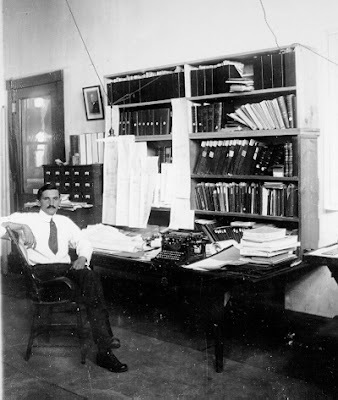 Samuel H. Knight, University geologist, a full century ago (source). Doc Knight joined the University of Wyoming faculty in 1916. By the time he retired fifty years later, he had taught on the order of 10,000 students, and was recognized as “Mr. Geology of Wyoming.” It was only then that he found time to study the stromatolites of the Medicine Bow Mountains. 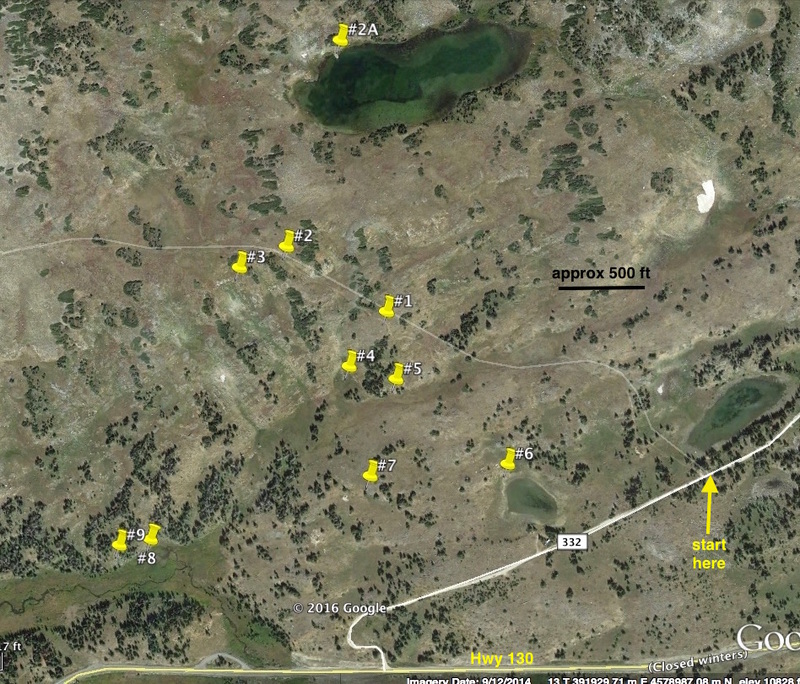 He visited, mapped, and drew them all. Now when we hike among stromatolites, we are following in the footsteps of a legend. 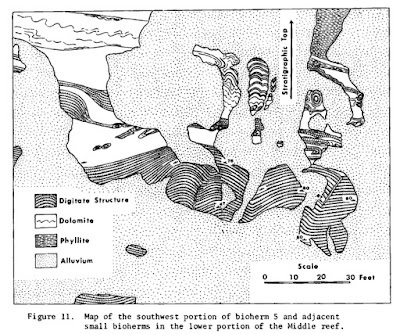 Doc Knight in 1965, with phyllite and stromatolites (source). 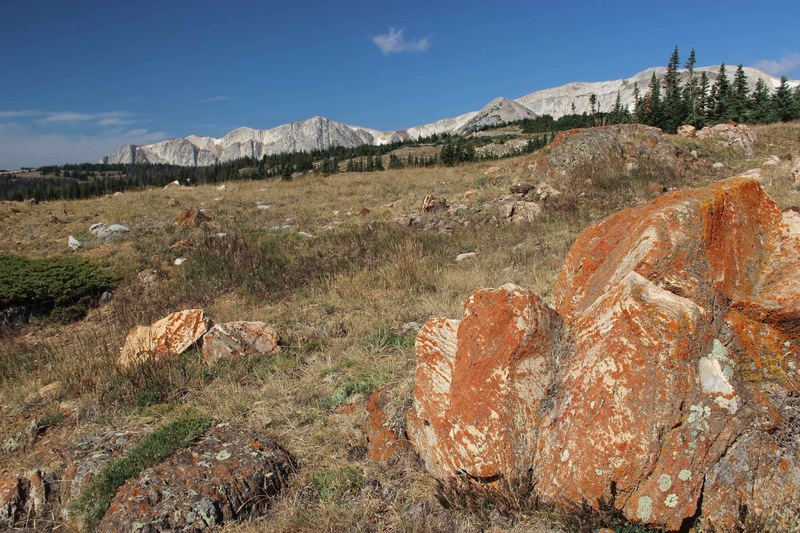 The stromatolites in the Medicine Bow Mountains are not obscure fossils requiring expertise to find. 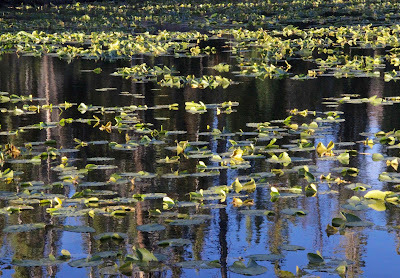 In fact, they’re downright conspicuous—if you know where to look. Fortunately, the Wyoming State Geological Survey published a guidebook with a map, aerial imagery, GPS waypoints and photos, as well as in-depth discussions of stromatolite morphology, paleo-environments and origins (Boyd & Lageson 2014). 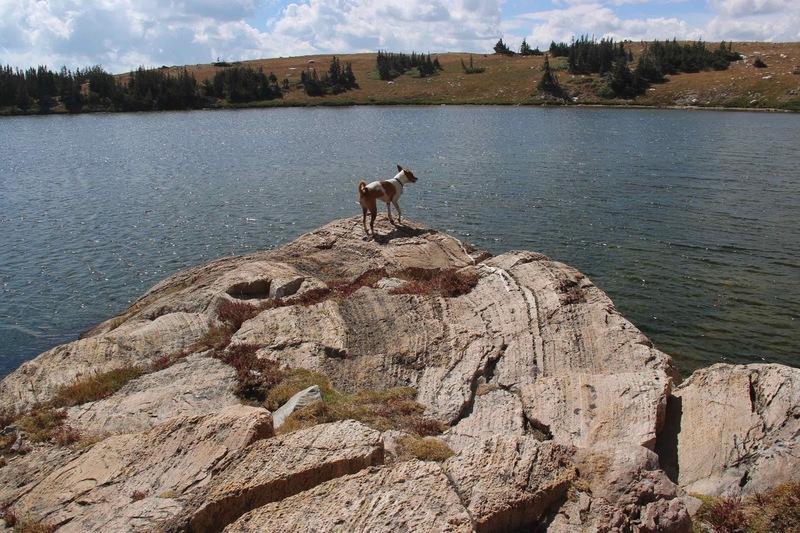 Now—with a little imagination—it’s easy to enjoy the warm marine waters that lay just off Wyoming two billion years ago. Before taking the tour, I plotted the tour stops in Google Earth. 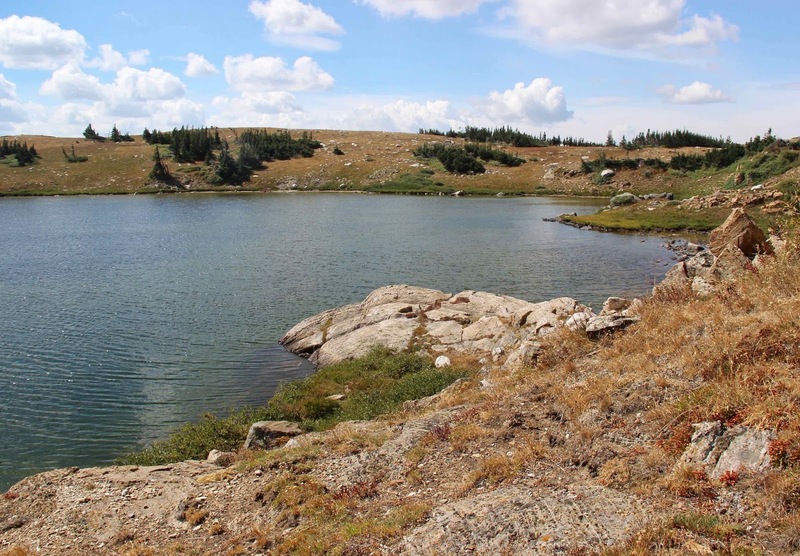 Two billion years ago (Early Proterozoic) Wyoming was on the southeast coast of a young small North America. Immediately offshore was a calm warm shallow sea underlain by limestone or dolomite. 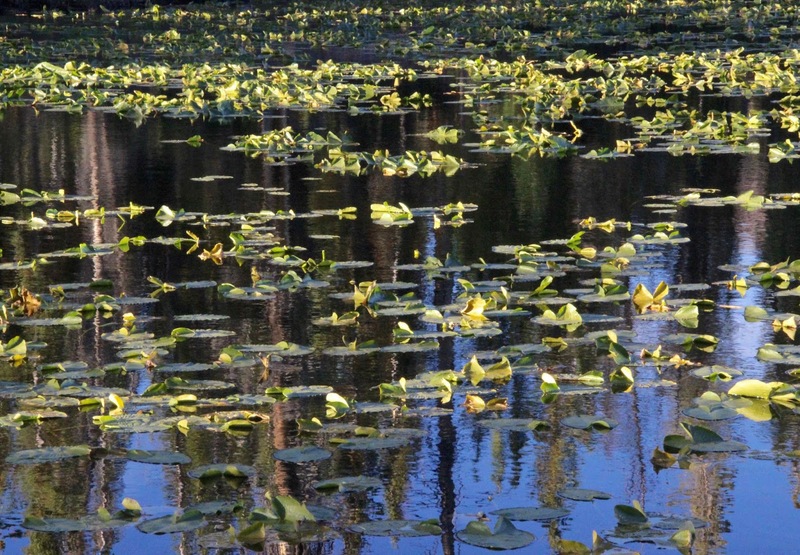 It was home to one of the dominant life forms of the day—cyanobacteria. These primitive single-celled photosynthetic organisms are best known today for their slimy green biofilms, but two billion years ago, when there were no higher critters around to eat them, they were more abundant and widespread. They built spectacular structures out of sand, mud and slime—stromatolites. 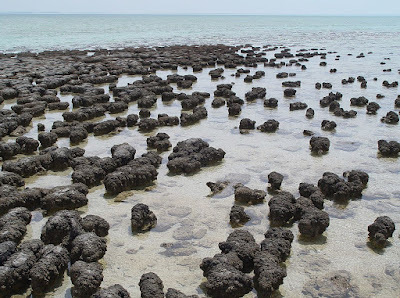 Now stromatolites are restricted to harsh environments where predators can’t survive, for example the hypersaline waters of Hamlin Pool in Shark Bay, Western Australia (source). 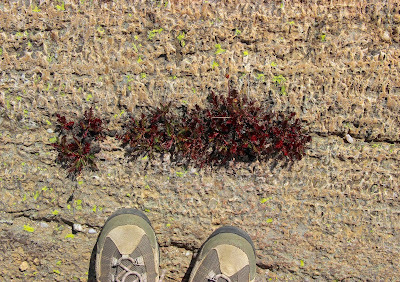 Whenever sand and mud washed into the sea and buried existing mats, the cyanobacteria moved up through the debris and made new mats … over and over. 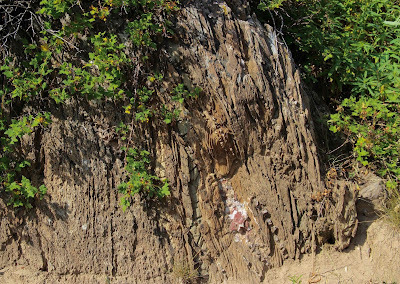 The soft fragile organisms were rarely preserved, but cemented layers of sand and mud remained and were eventually fossilized—turned to rock. 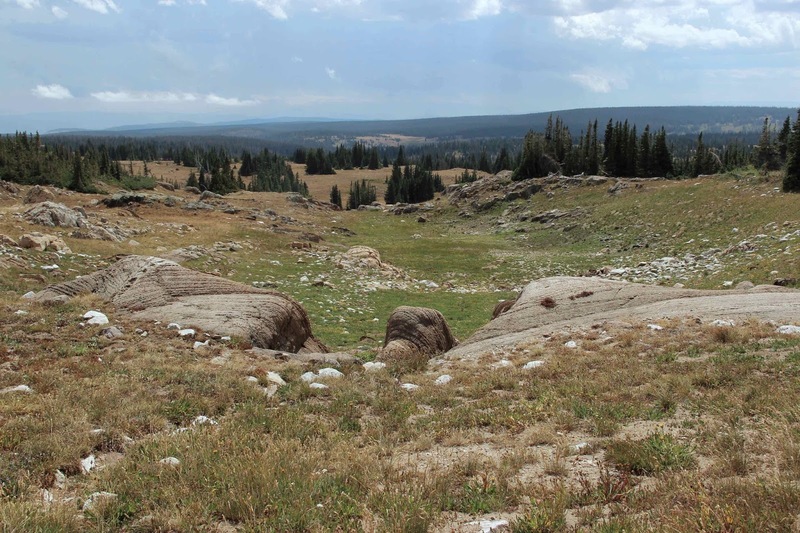 Now ancient stromatolites lie scattered high in the Medicine Bow Mountains, at 11,000 feet above sea level. 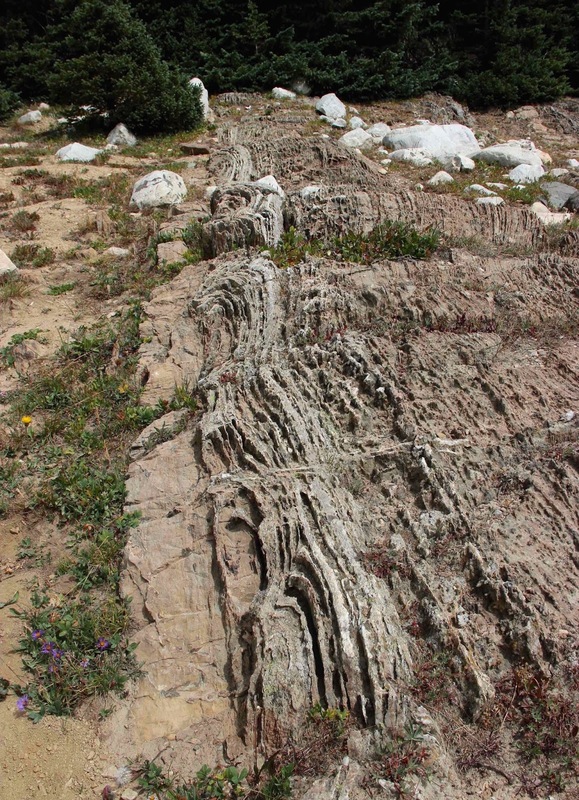 The stromatolites are part of the Nash Fork Formation—a 2 km thick collection of tan dolomite and stromatolitic dolomite with thick beds of argillite and phyllite (mud turned to rock and metamorphosed). 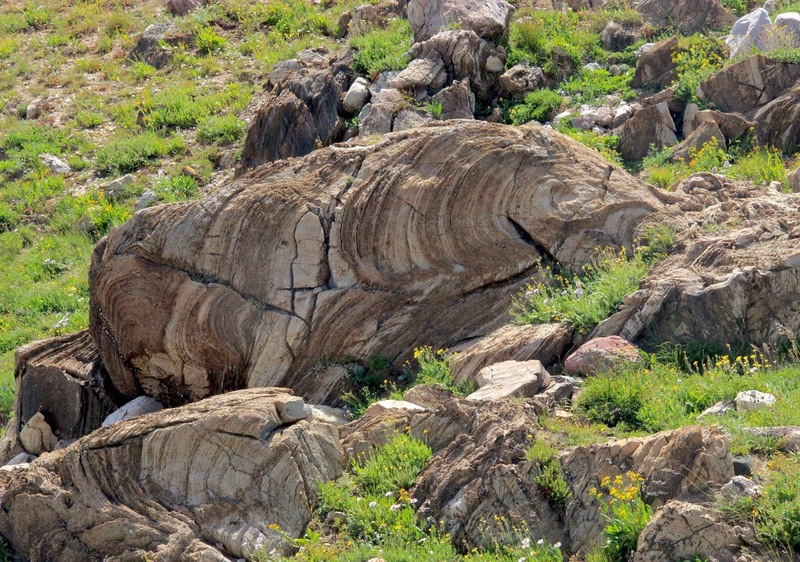 Even though these rocks are almost two billion years old, and have been through several episodes of mountain building and deformation, metamorphism was low-grade so sedimentary features are preserved. 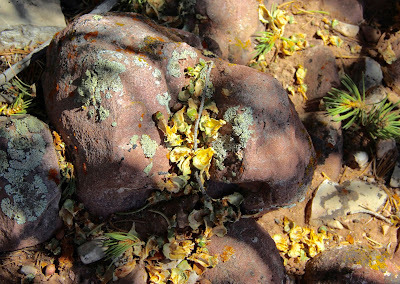 Orange lichen highlights the laminar structure of fossilized stromatolites (pen points to original base). 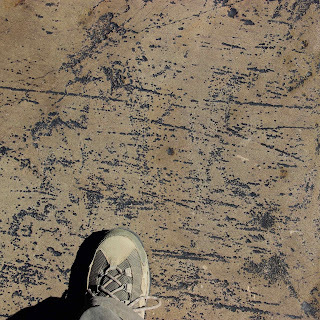 These stromatolites are just before and upslope from Stop #1. The Snowy Range in the distance is a beach turned on its side. 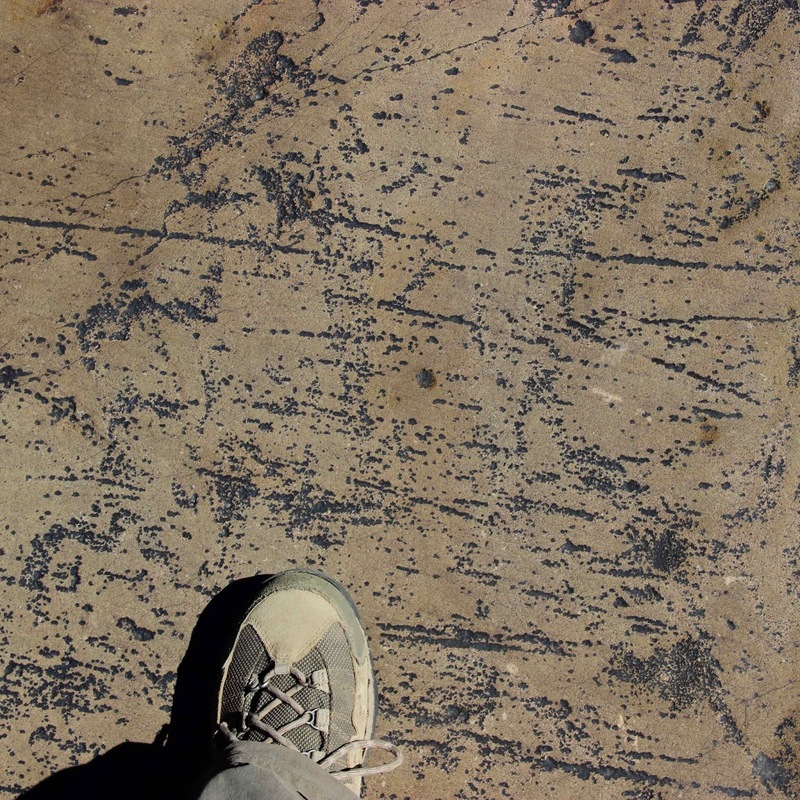 At Stop #2, stromatolites lie between beds of phyllite (metamorphosed slate) with thin layers of dolomite. 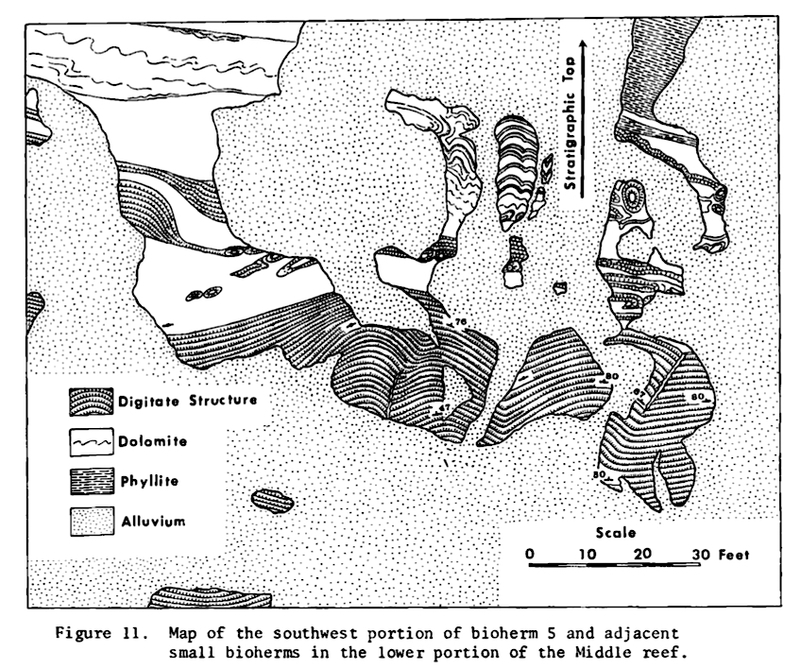 Sediments were tilted to vertical with continental collision (more info here). Stop #2A is optional. 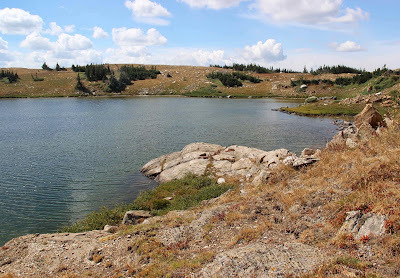 But it’s only a quarter mile away, and it would be a real shame to miss the huge glacially-polished stromatolite that sticks out into Prospector Lake. It’s about 15 feet across, and flat enough for a lunch stop. 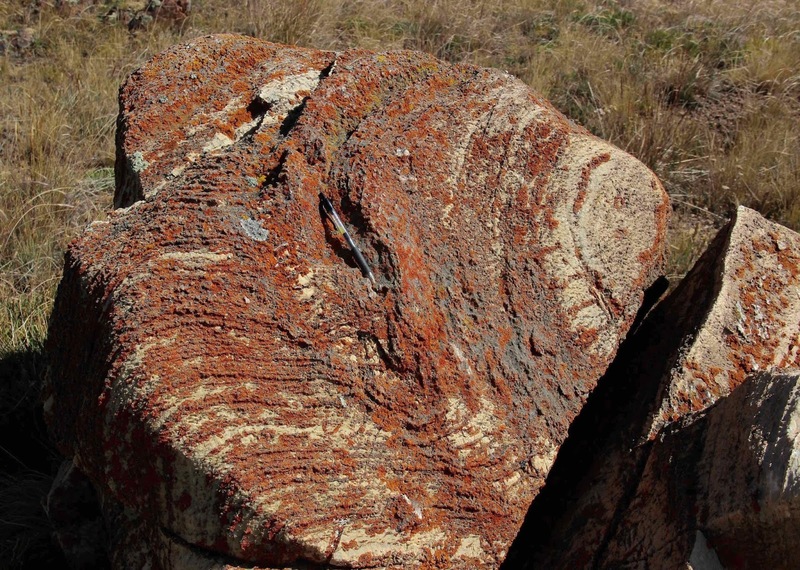 This famous stromatolite has been “affectionately named Big Daddy” by Boyd and Lageson. Big Daddy is just one of the many large stromatolites found locally—“true giants in the world of stromatolites!” according to the guidebook authors. For more monsters, continue on to Stop #3, the Valley of Stromatolites. Entering the Valley of Stromatolites (looking south). 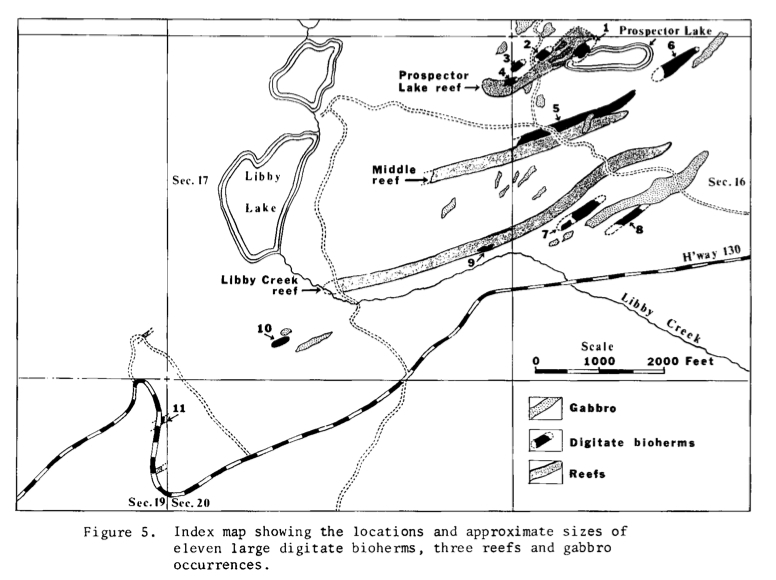 Doc Knight’s map of the Valley of Stromatolites. He used a 4-foot protractor to accurately measure the arching layers (see Knight 1968 for details). 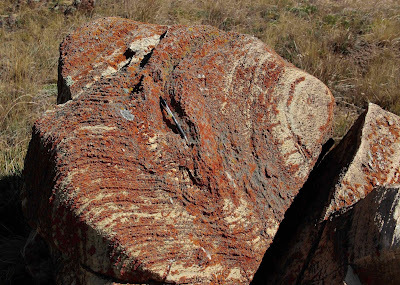 Some of the stromatolites were obviously deformed before they became fossilized. “… we became convinced that significant aspects of the present morphology of Nash Fork stromatolites are products of post-depositional processes.” This is the main thesis presented by Boyd and Lageson; see their guidebook for details. 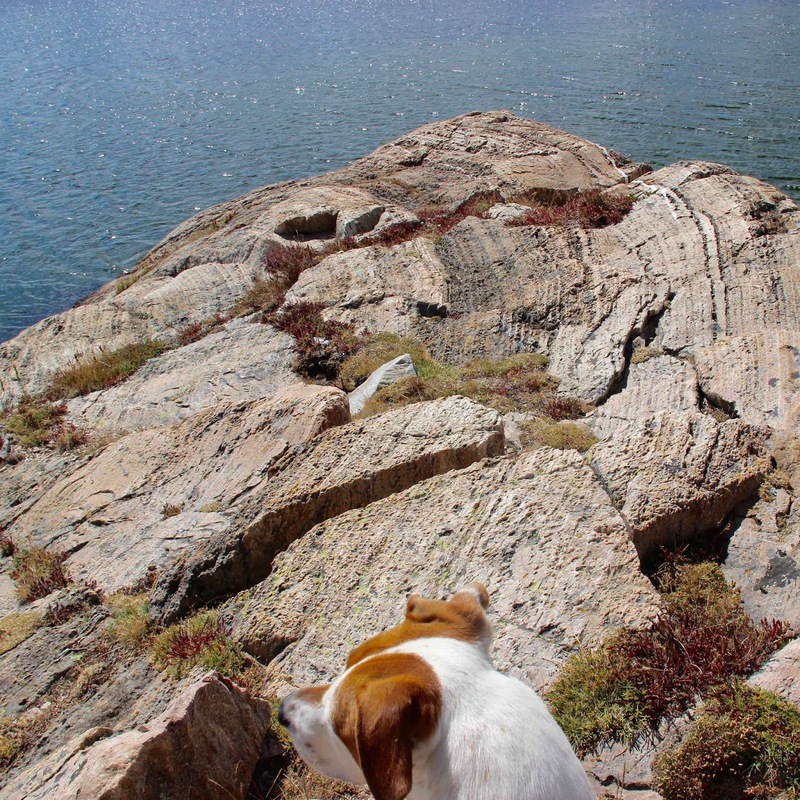 Note elongated stromatolite in center right of photo. Perhaps it was compressed before being turned to rock (original top is to right). Many stromatolites exhibit what Doc Knight called a “digitate growth pattern”—layers of small pillars between laminae. 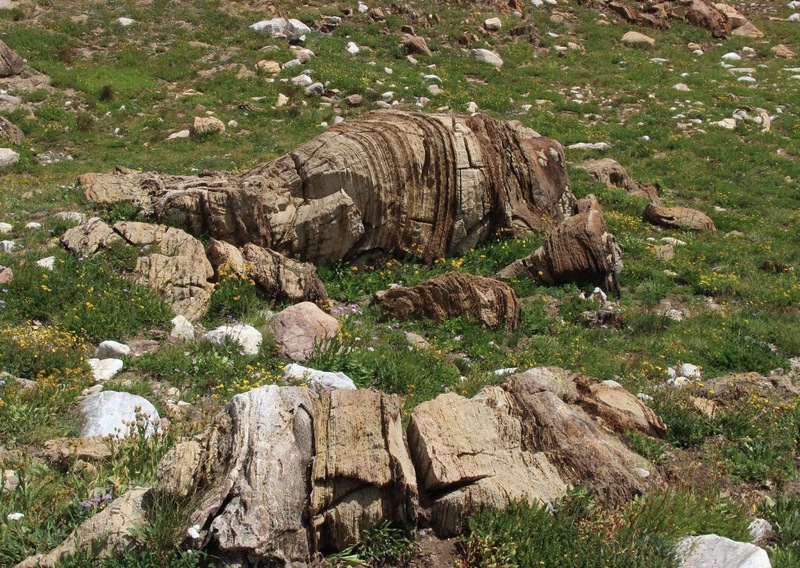 Close-up of glacially-polished digitate stromatolite, with alpine avens (Geum rossii). 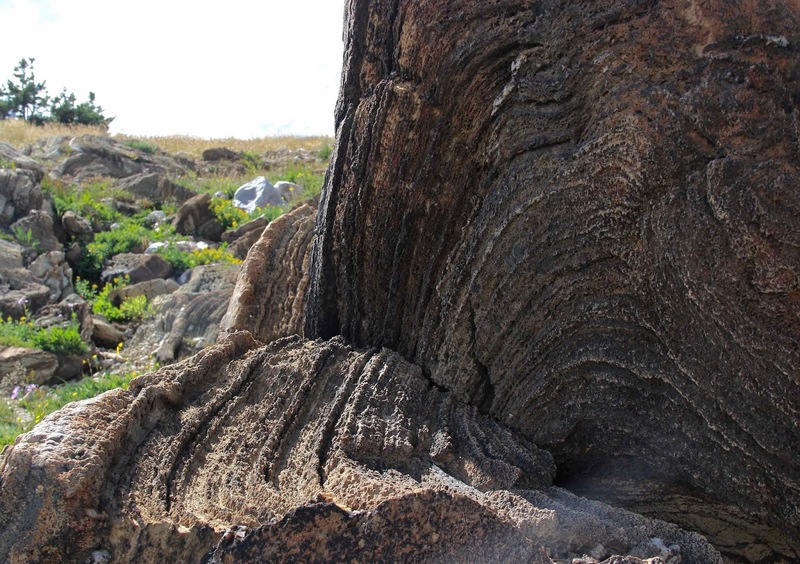 The photogenic monster below is probably the most famous of our stromatolites. It “has been figured in many publications” … understandably! Original top is on the right. 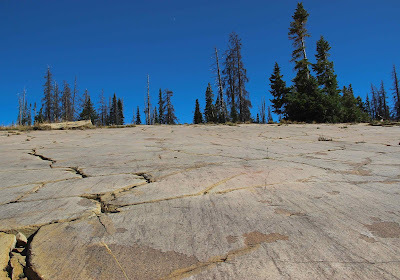 The most accessible stop is #10—a low outcrop of small linked stromatolites next to the Lewis Lake Road. 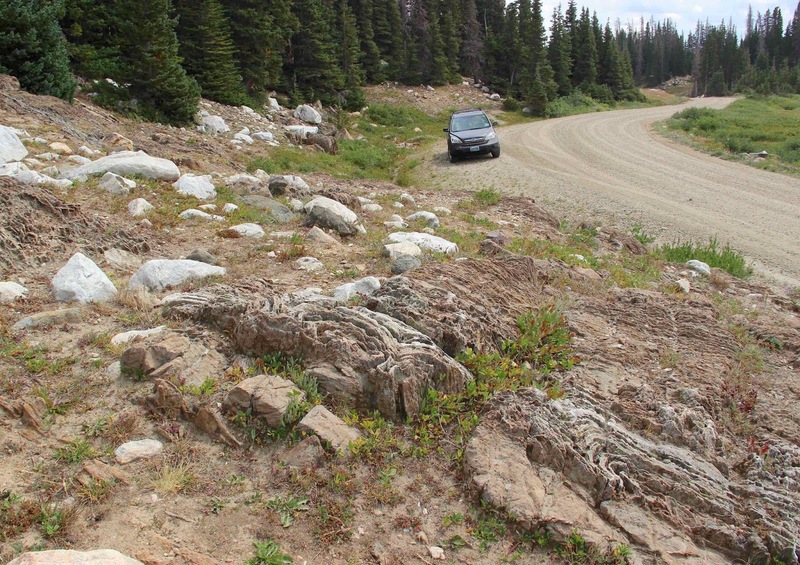 Pullouts were added on either side so geologists wouldn’t block traffic. Looking upslope from road; original top is to the right. But why do domal structures give way to flat layers? Always so much to ponder! 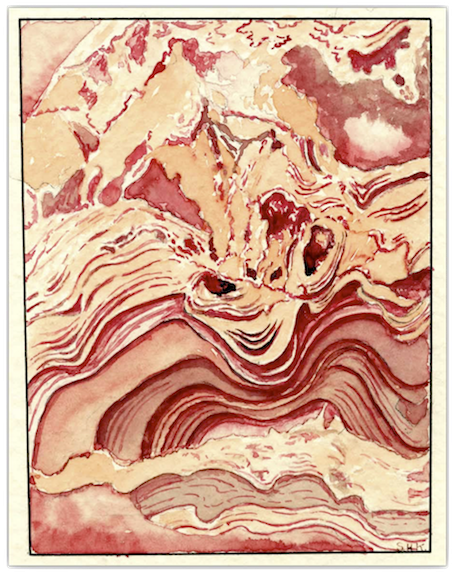 Water color painting of a stromatolite, by SH Knight. 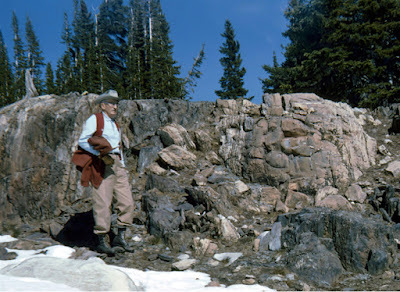 Doc Knight was an artist and a poet, as well as a pioneering geologist and beloved teacher. Currie, M. 1999. The wonderful world of stromatolites. Hooper Virtual Natural History Museum of Carleton College [lots of information!]. Knight, SH. 1968. Precambrian stromatolites, bioherms and reefs in the lower half of the Nash Formation, Medicine Bow Mountains, Wyoming. 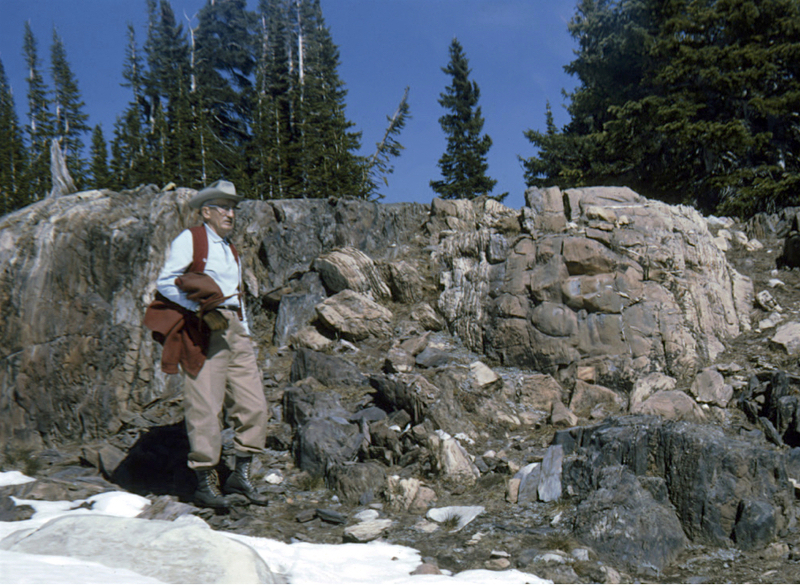 Contributions to Geology, University of Wyoming 7:73–116.